Since browsers on Xubuntu started using GTK3 instead of GTK2, and when saving a file, the dialog for entering a new folder name is white on white and hence unreadable. I gather this might be changed in ~/.config/gtk-3.0/gtk.css, but I am unsure under what element ID name that would be. Furthermore, is there a system wide gtk.css file that solves this issue for all users on this system? You should have /etc/gtk-3.0/settings.ini and possibly ~/.config/gtk-3.0/settings.ini. You can create the latter as a simple text file if it is not already present. 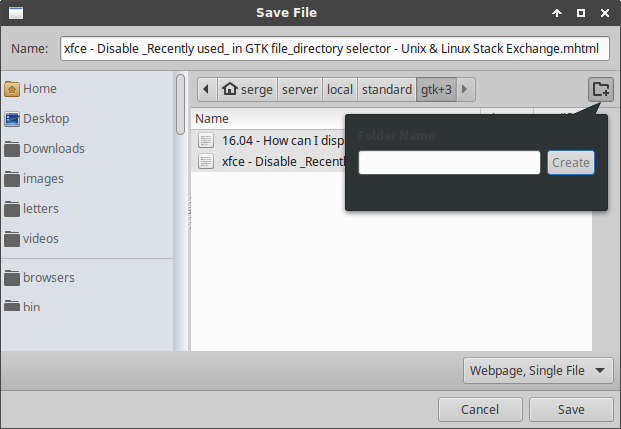 You can change the gtk3 theme in that file as well as in ~/.config/gtk-3.0/settings.ini. I like to have different gtk3 themes for user and for root (as a gentle reminder that I'm working as root). As suggested in the comments to your question, changing themes may help overcome the white-on-white issue. I found the culprit. 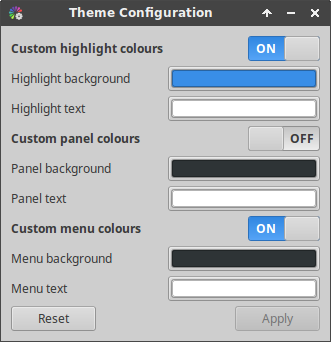 gtk-theme-config serves both GTK2 and GTK3 applications. Resetting Custom menu colours to its defaults resolves the issue. I opened a bug report against gtk-theme-config. Xubuntu LTS 16.04 comes with version 1.2.1-0ubuntu1. The bug persists in the latest version 1.2.2-1. Not the answer you're looking for? Browse other questions tagged configuration gui gtk3 or ask your own question. How can I make text in meld readable?